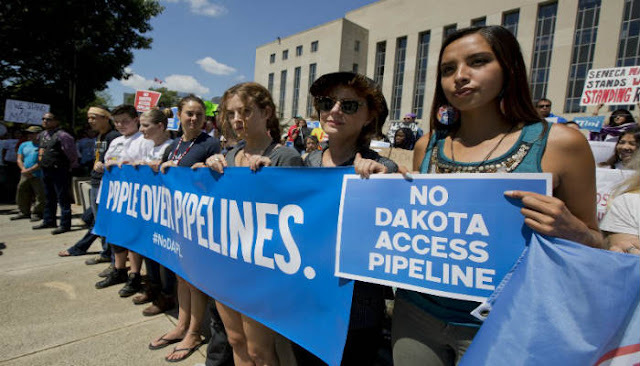 Running through a similar pathway as that of the well known failed Keystone XL project, the Bakken Pipeline would run across the Ogallala aquifer and the Mississippi rivers through sovereign Native lands. A federal court said on Wednesday it will rule next month whether to temporarily halt construction of a controversial oil pipeline that has prompted large protests in North Dakota. After more than an hour-long hearing, Judge James E. Boasberg said he’ll decide as early as Sept. 9 on the injunction request the Standing Rock Sioux Tribe filed against the so-called Bakken pipeline, a massive fracked oil line that would cut through four Midwestern states and hundreds of waterways. Native Americans say the pipeline threatens sacred sites and drinking water resources, and that no meaningful consultation took place. The Army Corps of Engineers disagrees. 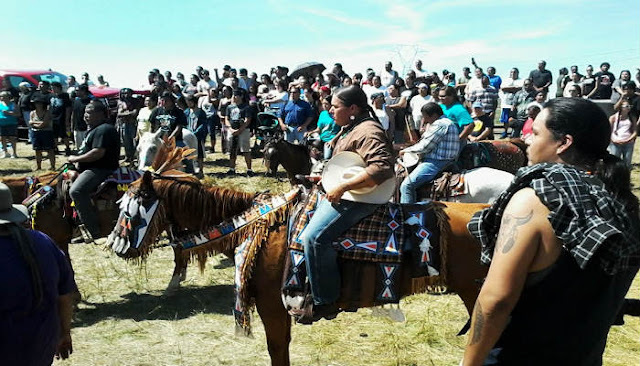 During the court hearing, the agency said the tribe declined to be part of the process. The tribe in turn said they didn’t want to legitimize a flawed process. The company building the pipeline, DakotaAccess, says the project is safe and will benefit the region and boost energy independence. They have, however, agreed to stop construction in that area of North Dakota until the court rules on the injunction. The hearing in D.C. comes about a month after the Standing Rock Sioux Tribe sued the Corps over the permits the Corps gave to the developer, DakotaAccess, to build on an area roughly half-mile north of the reservation, and through the Missouri River — as well as other federal waterways. Dating back to 1989, the Exxon Valdez oil disaster springs to mind when we mention the last 30 years of history regarding production and distribution of oil. This creates doubt in many regarding the future investments in antiquated resources as they feel there is no monetary value in further pursuing this path. Europe and Asia are ever striving for a reduced carbon footprint and greener energy sources, whereas America is more interested in nostalgic energy sources. The Bakken pipeline is roughly 48 percent complete, officials said during the court hearing, and the line is scheduled to start delivering oil in January. Construction is ongoing almost everywhere else, though a small group of Iowa landowners managed to get a construction reprieve from state regulators Wednesday. As the court hearing went on indoors in D.C., outside scores of mostly NativeAmericans from as far away as Arizona gathered in a packed rally that continued even after the hearing was over. Actresses Susan Sarandon and Shailene Woodley were part of the protest. Woodley, who has been protesting in North Dakota, is one of many celebrities that have over the past few months called along Native Americans for a halt to construction and a repeal of pipeline permits. Comparable in size to the more-famous (but rejected) Keystone XL, the Bakken pipeline is slated to be the largest oil line coming out of North Dakota’s Bakken oil fields, among the nation’s most active due to the fracking boom. The line would move up to 570,000 barrels of sweet crude oil daily through the Dakotas, Iowa, and Illinois. Most of the affected land is farmland, but the project does run through wildlife areas and major waterways like the Mississippi, and the Missouri, the longest river in North America. Would you instill your trust in America’s track records relating to oil disasters? Could we even remotely lay our trust in the very government and private industry when it comes to running major rivers and watersheds? Just imagine the possibilities of water contamination in areas spread over Texas to North Dakota! This post was republished from countercurrentnews.com. You can find the original post here.